where is the function "in-game action" ? Which is between this functions? Aura RGB LED lighting was developed to perfectly complement your gaming rig for a true expression of individuality. Aura RGB provides a nearly endless spectrum of colors, patterns and even the ability to link lighting to music, in-game action, or CPU/GPU temperatures. Furthermore, the function is already activable for Call Of Duty Back Ops 4, but I do not know how. Last edited by spaccossa; 10-23-2018 at 05:58 PM. Yep, looks like it should. 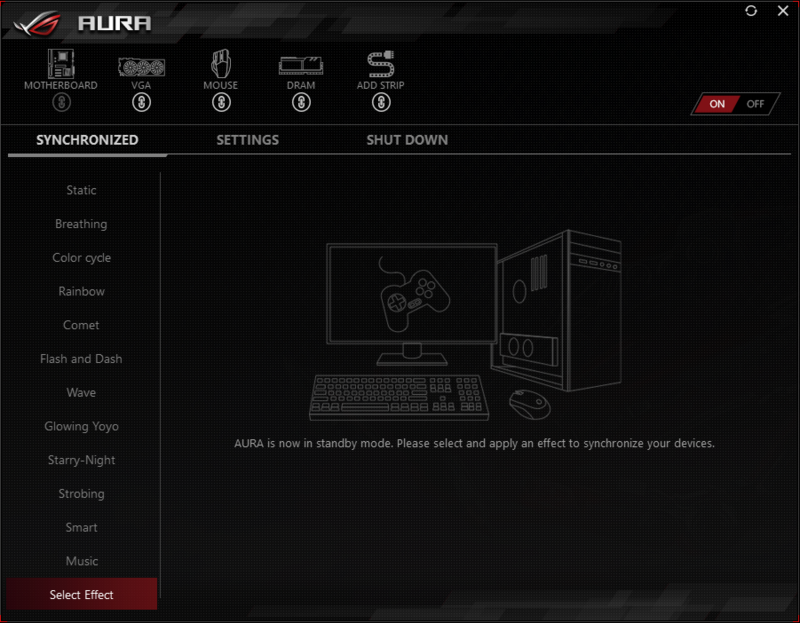 I use Aurora for gaming integrations, but since ASUS' SDK isn't being updated, it doesn't have support for Aura Sync yet. To be honest, I think it's dead even. Yep, looks like it should. I have already the latest version 1.07.17, but I can not find the function to enable it. I use Aurora for gaming integrations, but since ASUS' SDK isn't being updated, it doesn't have support for Aura Sync yet. To be honest, I think it's dead even. Aura Sync is dead? I do not think .. It would not explain the introduction of this feature in the collaboration with COD BO4 and would not have sponsored it on almost all the products they are selling.